Add-on: AGC and Speech Enhancement, Total Recorder - captures any audio from the Internet, records audio from CD, microphone, line-in, converts any sound formats to WAVE file. Phone recording system. The Total Recorder Automatic Gain Control (AGC) and Speech Enhancement Add-on is a multi-purpose program with a number of unique features designed to enhance the recording and playback of the spoken word. The AGC Add-on is designed to control the sound level of speech recording during playback and recording. The add-on does not use the system mixer to modify the sound level. All adjustments are made within the add-on using digital algorithms. The add-on allows for sophisticated correction of the dynamic range of sounds. For instance, it can perform the functions of Compressor, Limiter, Noise Gate, and more. The add-on's user-friendly graphic interface allows you to precisely adjust the dynamic range modification envelope. Changes being made are displayed on a graph of input vs. output levels. For those users who are not familiar with detailed adjustments of the dynamic range modification envelope, this add-on offers a variety of different presets. You can use a preset as is, or you can use it as a base and then adjust the settings. A built-in Voice Activity Detector (VAD) will skip audio fragments that do not contain voice data during audio processing. This greatly improves the accuracy of the add-on's performance on voice recordings because fragments of pure background noise do not affect the algorithm's performance. For example, if VAD is activated, the add-on does not increase the recording level (and correspondingly, the noise) during long pauses as most AGC algorithms do. Another unique function is the automatic suppression of background noise in voice recordings. This function can either be used separately or together with AGC. For example, you can use the add-on to apply only noise suppression to a voice recording. Process => AGC and Speech Enhancement. Show / Hide the AGC and Speech Enhancement Window. Help => AGC and Speech Enhancement Add-on Help. Launch the AGC and Speech Enhancement Add-on Help. A screen shot of the AGC and Speech Enhancement Add-on main window is shown below. 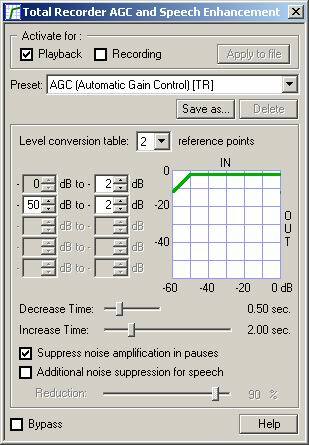 The AGC and Speech Enhancement Add-on Version 1.1 requires that you install Total Recorder Version 7.0 or higher. Beginning with version 1.1, the AGC and Speech Enhancement Add-on uses a new format for the registration key. If you are a registered user who wants to upgrade and you did not receive your new registration key, use the self-service registration key management system or contact support@totalrecorder.com . Note: The AGC and Speech Enhancement Add-on V1.0 requires any edition of Total Recorder Version 5.0 or higher.